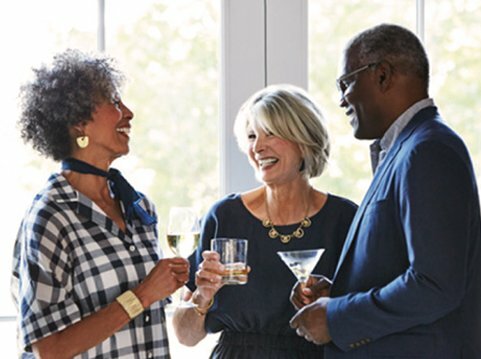 When you arrive at The Colonnades, a stunning independent living community nestled into the lovely, inviting town of Charlottesville, Virginia, you will immediately recognize the warmth and happiness of the residents who have chosen to make the community their home. Described by many visitors as warm, intimate, and inviting, The Colonnades has a relaxed yet sophisticated and vibrant feel that makes it unlike any other retirement community. Among the many benefits of life at The Colonnades is the freedom to spend time enjoying the beauty of the surroundings without any of the worries of household chores or home maintenance. Our community offers a wealth of activities designed to appeal to the curious, intellectual older adult, as well as options for fitness, musical appreciation, and social interaction. Our dining program is another highlight, led by an executive chef and featuring a variety of cuisines that are made-to-order and showcase seasonal ingredients. Residents and families will tell you that there is a peace of mind that comes with knowing there is additional care available if needed. We value the concept of aging in place, and – should the need arise – we offer 24-hour medical care and assisted living services. Our individualized care supports freedom of choice and dignity, so you can live the life you want each day. Our residents are friendly and approachable, and we would love the opportunity to show you our community, our spectacular grounds, and our lovely accommodations. Call us anytime to set up a private tour and we can show you what life is like at The Colonnades. Join us as Stephen Landis and Brandon Lloyd of AskLandis stop in to our community for an informative presentation on downsizing and de-cluttering. They will share helpful tips and tricks to make your move more manageable. Give us a call at 434-963-4198 with any questions or to RSVP. At The Colonnades, our "Try Us Out" program offers the opportunity to experience life at our community before making a long-term commitment. You're invited to enjoy all of the benefits of maintenance-free living on our gorgeous 60-acre campus, along with our full range of activities and amenities, to make sure our community is the right fit for you and your family. Contact us today at 434-963-4198 to learn more about the "Try Us Out" program.